Begana MAKES YOUR LIFE BETTER!!! Product Size: approx 3.5" * 5"
Materials: The shell is premium engineering plastics, the grips are stainless steel. * Made with environmental protection material, which is also energy safety and environment protection. 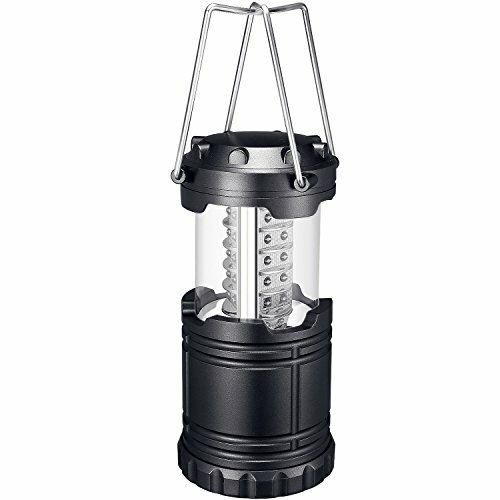 * This LED camping lantern is a beautiful, delicate, protable and neatly designed lamp, It's specially suitable for hiking, outdoor camping, family emergencies and traveling as well as reading,useage and working area. * With special technology, it owns gentle lighting, better visual effect and remove tired vision. Also it is energy save and environmental protection, long using life. Widely applied in the hotels, markets, schools, hospitals, exhibition halls,entertainment areas, enterprises,outdoors and so on. Please note: When closed, please check whether the lamp is turned off to avoid the waste of batteries. LOW CONSUMPTION - Lasting light up to 12 hours with enough battery capacity (AA battery not included). STAINLESS STEEL HANDLES - Suspend the lantern or carry with ease. Ideal for outdoor trips or emergency events. DEPENDABLE BUILD - Constructed with military grade & water-resistant plastic; promising long-time durability, no matter where you go. ULTRA BRIGHT - Includes 30 individual low powered LED bulbs, designed for a longer lifespan. Carry 360° of luminous light while saving energy. DESIGNED FOR CONVENIENCE - The extremely lightweight build allows you to take your lantern with ease. When not in use, you can retract the lantern to a smaller size; So you can store it with little space, saving space effectively. If you have any questions about this product by Begana, contact us by completing and submitting the form below. If you are looking for a specif part number, please include it with your message.